Last year, amidst ongoing ideological debates about climate change and government funding of the arts, two unexpected voices testified before Congress. These military voices command the respect and attention of the military-oriented public, and carry authority because the military is considered a neutral voice. There are ideological differences, but politicians can make the differences look larger than then are. 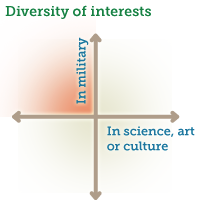 For example, in the sciences, House Republicans cut Obama’s budget recommendations in science and art (see graph at Nature). And in the arts, in January 2011, a group of 165 House Republicans, proposed to cut federal funding for arts, eliminating funds for NEA and NEH, and public broadcasting, as well a other liberal policies like public transportation. When looking at budget discussions, it’s important to maintain some perspective: In terms of the Federal budget, the funds assigned to defense are colossal. The Federal budget for defense ($691B in FY2010) is five-times the sciences’ ($137B in 2010) and dwarfs the National Endowments for the Arts’ (NEA) and and the National Endowments for Humanities’ (NEH) ($0.34B in 2010). When it comes to controversial science topics like climate change, ideology does play a larger role. Regarding climate change, one in five Americans are doubtful or actively dismissive about global warming — and nearly all of the people with extreme views on the validity of climate change science are conservative Republicans. (See “Six Americas” PDF). This is where Rear Admiral Titley’s testimony and outreach is so vital. In the sciences, there is a popular blog (290 posts, 600k visitors in 2010), Armed with Science, run by DoD which often features blog posts by scientists and various military departments. For climate change in particular, Rear Admiral Titley directs the Navy’s Task Force Climate Change, TFCC (see their charter, PDF). TFCC maintains a Facebook page liked by 605 people, and Titley gives a variety of public speeches which raise attention in the press and among bloggers. In the arts, General Bivens feels there is a lot of untapped potential. He emphasizes that the vast majority of people in the military respect the arts and culture, and appreciate the importance of cultural diplomacy to America’s long term security. He suggests arts outreach projects focused on cultural diplomacy in foreign countries, trainings for military personnel, and services to veterans and military families. For families, one example is the Blue Star Museums project (joint between NEA and Blue Star Families, a support organization for military families), which gives free museum admission to military families in the summer. NEA chairman Rocco Landesman wrote in Feb 2011, that a quarter of a million military families visited one of the 920 Blue Star Museums over summer 2010. Upcoming blog posts will look at these programs in more detail. If you know about more projects, please list them in the comments.